Prime number cellular automata, PNCA, accept natural numbers as inputs/output and have a prime number control parameter, CP. They generate a multi dimensional number space on each iteration. In these spaces we observe a new prime number property, languages of symbols, syntax and grammar. Symbols are represented as discrete, matrix like collections of integers with the metric of the matrix identical to CP. Each space consists of a periodic geometry of symbols based on the specific space group , SG, of the PNCA used. 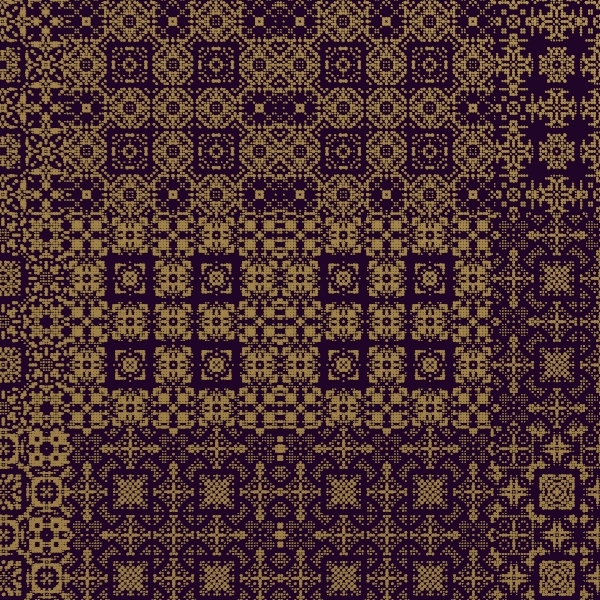 Iterations of the cellular automata, the frames, are cyclic based on CP. For a CP of P, frames modulo P to each other, e.g. 1P+1 2P+1 ..., contain an identical and finite set of symbols termed the geometric alphabet. Selective ordering of symbols with neighbours defines syntax. Larger geometric collections display the grammar and in total define the geometric narrative. Each narrative is based on CP,SG,Frame Number and other parameters defined at frame zero. Metamaterials are an emerging field in physics where periodic and geometric patterning at the nano scale create new materials with novel properties. In this film I render geometric narratives as an aerial view of two hypothetical metamaterials. Metasurfaces renders the narrative value as the diameter of a disk for CP's of 23, 41 and 79 . Photonic crystal separates the narrative values into two sets and uses the xy positions of one set to display a hole. The CP for this narrative is 233 and symbols of the alphabet show an additional 5 x 5 grid of sub geometries and differing symmetry on the x and y axis. The sound track is taken from previous audio experiments and are produced by mapping a section of narrative from number to audio frequency, Lydian scale and Minor scale root A respectively. Neighbouring points determine harmonics and hence timbrel quality. A smooth transition across the narrative results in continuous audio, the tune. They have an unexpected compositional content.